Trade in London’s Soho, a kindly priced members club for those connected to the hospitality industry, was brought into being by two star Master Sommelier operators. 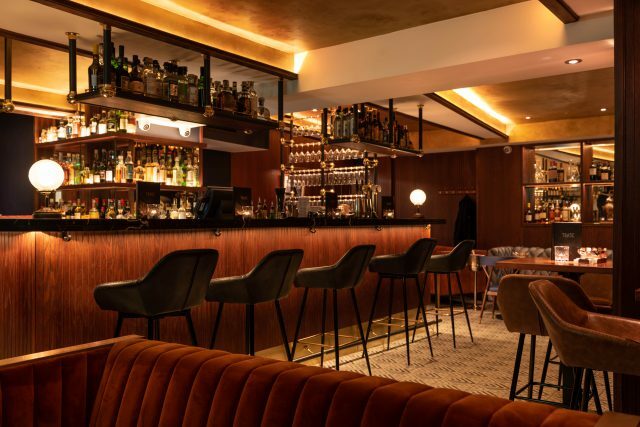 A classy refuge, day and night, for an initial 800 members of the hospitality trade, who are typically “hedonistic, but not very rich,” says Xavier Rousset, co-founder with Gearoid Devaney of this bijou Frith Street members club, as well as Blandford Comptoir, Comptoir Cafe & Wine and Cabotte. Accessed via entryphone, the nondescript matt grey frontage beside the vivid Bar Italia gives way to a potentially decadent chamber with a brushed gold ceiling (adding an extra £6,000 to the build! ), framed historic menus, and well-equipped handsome bar (thanks to Speciality Drinks’ Dawn Davies MW) and authored coffee counter. The best seats are the sofas in the alcoves. GM (and keen golfer, “weather permitting”) Michael Burke (formerly of Craft and Soho House) is the urbane mine host. Wholly repaired and refitted, the former gay members club required much TLC to remedy water ingress, and is proving a learning curve for Master Sommeliers, Rousset and Devaney. “We’ve never done a members club before and are noticing things like Monday’s busier than Saturday.” Keep an eye out for special events, such as Bloodshot, an after-hours feast by chefs for chefs created by The Dairy’s Robin Gill, who worked alongside Rousset and Devaney at Le Manoir Aux Quat’Saisons. Dishes by head chef, Tony Monzó (formerly of ETM, Aubaine, and Club Gascon) are not fixed to one cuisine and may include: miso braised mushrooms on toast with raw yolk, slow-cooked, crispy suckling pig (72 hours noticed required) and crêpes Suzette. *Please note the 2019 scores will be published in May 2019.